And lo, we have the whole core of what Wednesday and his fellow much reduced gods are facing – being forgotten and dying. Before we get to the war we have the very heavy and very awesomely acted and highly emotional moment of Shadow reuniting with his dead wife. There’s a lot of excellent emotion from Shadow here – anger and grief and shock and just plain on-the-edge-of-breaking trying to understand everything. Laura seems to try and hold up the idea that hey-miracle-I’m-back-let’s-focus-on-this but Shadow isn’t as quick to run with it. After the last few days, coming back from the dead isn’t going to distract him. Or, maybe, after the last few days coming back from the dead is just something else he can’t even absorb at the moment. There’s a definite sense of Shadow reaching a breaking point. He’s not exactly ready to let go of the whole cheating on him even as she describes her mindset and assures him that she does truly love him. She tries to seduce him but I’s all faintly surreal with her doing things like bathing in hot water to raise her body temperature for him – it’s all faintly surreal, slightly creepy. When she kisses him, her heart beats – pointing to him giving her some sense of life. Laura is confident and certain about what she wants but Shadow just feels kind of lost, needing time to just absorb everything. I can’t say enough how good this scene is with all the emotion and eerie feel and poor Shadow just being kind of lost in the middle of it. Though he’s interrupted by Wednesday who has just been woken up by one of his ravens – Hugnin or Munin (and this episode is definitely the one where all of the could-be-maybe-is-it-magic becomes Oh yes, magic and gods clearly on display) warning him about the police arriving; who promptly arrest Wednesday and Shadow for bank robbery. Oops. At the police station Wednesday pulls out his full dementia act and then doubles down on it by telling them the truth – that he was recruiting and ancient terrifying god which even the new gods are afraid of. He’s duly confused his police officer while Shadow is wisely stonewalling his, demanding a lawyer repeatedly. She ominously tells them about the dangerous enemies Wednesday has – someone sent them a fax detailing exactly where they were, to actual map grid references and the vin number of the car. And the fax machine wasn’t even plugged in. Putting them both in the same room, presumably to record their conversation Wednesday warns Shadow they need to get out quickly before they’re seen – and killed. Wednesday is eerily afraid but thankfully Nancy is there to open the cuffs. But we need to catch up with the new gods. Media ambushes Technical Boy to read him the riot act about images and narrative, all the while looking so much like Bowie, it’s positively eerie. She is concerned about image, about branding in the eyes of Mr. World (and it’s clear the New Gods – maybe all gods – are very concerned about image and narrative). Specifically they sent Technical boy to ask Shadow some questions and ended up with him lynching a black man. Media and Mr. World are clearly very aware and not happy with the racial connotations of this (I’m very glad that American Gods hasn’t tried to gloss over this while aiming for more Odin references). Media demands an apology – not for Mr. World, but for Shadow and Wednesday. Technical Boy just can’t understand this as they’re completely ignoring Wednesday as he runs around and recruits “monsters” for his cause to which Media gets cryptic. Media talks about both the fear of Wednesday being a martyr since martyrdom is a powerful belief (hence al the sacrifices we see) – and as for Technical Boy dismissing him as delusional? She is Media, she has seen the terrifying power that mass delusion can have, even implying there are aliens out there simply because humanity has been convinced about this by media delusions. In a world where, as the opening scenes was clear, gods are born by human belief, mass delusion (and the power of Media herself) is a major force. To which we return to the prison where Media comes to the police station with all the electronics flicking off – and she comes as Marilyn Monroe and floating about a foot off the ground. If Shadow had any doubts about the supernatural before, this is beyond clear – the supernatural thrown right in his face. He is duly freaked out. She is here to introduce Mr. World who arrives with one of the most epic displays of creepiness ever. The floor tiles lighting under his feet, telling Shadow incredibly private information about himself and his family, changing his face to Shadow’s and then just pixels – Mr. World is everything, knows everything and can open handcuffs with a wave of his hand. He is definitely powerful and Wednesday is definitely afraid of him. They also drag in Technical boy, manhandle him, offer him to Shadow for some violence before making him apologise and acknowledge how racially terrible the whole thing was. Mr. World is here to recruit Wednesday – in a long speech about rebranding and adapting (which is what the new gods are all about) he denies there’s even a war between them – tghey want a merger. They want him to be part of the new collective – and again Mr. World has a big speech about how everything is connected and related and the individualism of the old gods no longer applies. It’s a long speech with lots and lots to unpack here, from the idea of individual narrative to a greater context/system (and the implication that that greater context basically means a level of subservience to Mr. World since he seems to be the ESSENCE of the collectivism) to how narratives and gods are shaped to what the actual roles gods have. The method they propose is a nuclear satellite – called Odin (and everyone has guessed Wednesday is Odin by now, right?) to nuke North Korea: name, narrative and human sacrifice. All the keys to god power. Wednesday isn’t buying it. He knows he’s a pain in their backsides – or grit in their oyster – and he recognises them trying to sideline and co-opt him. On some level they’re afraid of him – or, at very least, respect him. As Mr. World says to Technical Boy (who doesn’t understand why they don’t kill him right there), Wednesday is older and wiser than Technical Boy will ever be. He’s cunning and Mr. World seems at least a little wary of that. Technical Boy isn’t – but Media shuts him up with a tooth-shattering blown kiss before they leave to let Wednesday consider their offer. Wednesday also claims that he and his fellow gods give something back – rather than just command attention. Which is an interesting point – because every time we’ve seen the gods being born or being established in America so far, including Nanunini, it has been because someone has prayed and asked them for something. From Anansi’s slave ship to Odin’s Vikings killing each other for wind even to Anubis helping people to the afterlife. They provide something… do the modern gods do that? Or do they just entertain? Do they just, as Wednesday says, consume attention? Wednesday and Shadow leave – through a ruined police station full of brutally murdered police and a terrifying animate wood/tree (I wonder about that – living wood doesn’t seem like a Modern God power). Well that’s the battle lines laid out and we can clearly see which side represents what and all done with several layers of epic and power and eeriness. This episode is where all the epic meta finally started. No more hinting, the cards are revealed and the big powers and stances have been revealed – all while being eerie, powerful, well acted and with some amazing visuals. 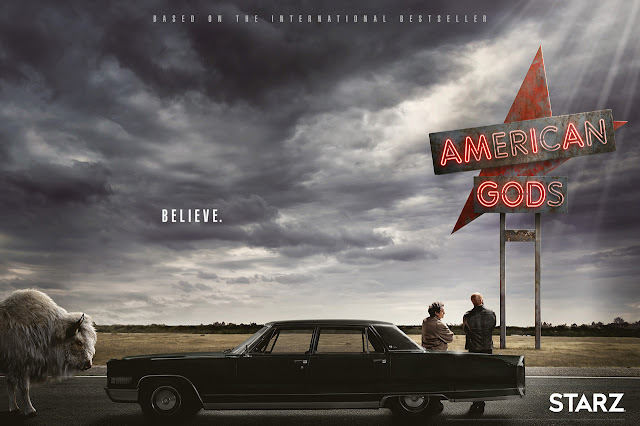 Completely unrelated tangent – the very concept of American gods is new media replacing the old gods – but I wonder about how we’d actually see more of a resurgence? I mean, go back 100 years, how many of your average people around the world would have heard of Odin or Czernoborg? But modern media spreading old stories, retelling old stories, spreading those stories to every corner of the world would surely give them greater attention than ever before? Sure, more people may know Odin as the father of a superhero with a metal eye-patch in a weird sci-fi setting than as the old wanderer, but they know of him.